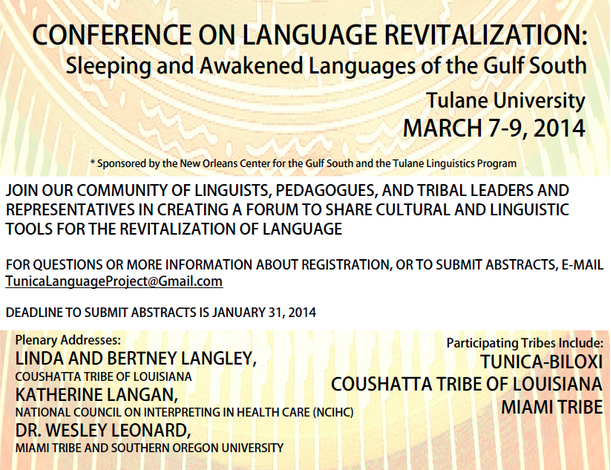 In March of 2014, Tulane University hosted its first “Conference on Language Revitalization: Sleeping and Awakened Languages of the Gulf South.” Sixty attendees, including linguists, pedagogues and representatives of the Tunica-Biloxi Tribe, the Miami Tribe and the Coushatta Tribe of Louisiana participated, with a total of 20 universities and tribal affiliations represented. The conference featured 17 individual papers, three plenary addresses, three workshops and a working group discussion. The first day of the conference included a collaborative plenary talk from a linguist and a tribal leader who work on the Koasati Language Project, numerous talks from Tulanians who participate in the Tunica Language Revitalization Project, and a talk about the American Indian Language Development Institute. The second day featured a plenary talk about the Miami language awakening efforts on both the Oklahoma and Ohio reservations, a panel of papers featuring various indigenous voices from the Gulf South, three workshops featuring language teaching techniques, and a networking reception. 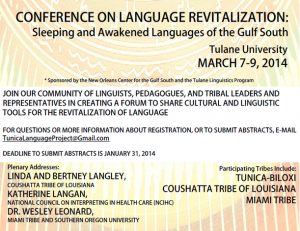 The third day included a plenary talk on the future of language revitalization efforts, a panel illustrating practical approaches to the integration of culture into the language learning process, and working discussion groups that produced a series of recommendations for indigenous language programs in the Gulf South. Overall, the conference was successful on multiple levels. This event managed to integrate indigenous and academic voices to a degree that is not often found. Participants all agreed more revitalization work needs to be done, and the conference should continue in the future given its fruitful outcomes. Poised to become a biennial occurrence, the next conference will take place in 2016. The above information about the 2014 Conference on Language Revitalization is taken from a final summary report authored by Joyce Bennett. I’d like more info on the Tunican language project if there will be one in 2015. This is a long overdue reply. There was not a Conference on Language Revitalization in 2015. There is talk of doing one again soon, but dates are unclear. Definitely keep an eye on our website or facebook page for updates (https://www.facebook.com/tunicaproject). Tikahch! Thanks!